As you might imagine, the roots do taste like parsley, but not overwhelmingly so. They’re more like an amalgam of parsley, potatoes and turnips. Delicate, light and refined. I love them. I do of course recognize that maybe one in 500 of you actually have access to parsley root. It’s rarely sold in markets, although the seeds are easily available if you want to grow your own. My advice is to sub in parsnips, which are in pretty much every supermarket in America. Really any other root vegetable will do. Playing with flavors is what I do, and I happen to know that parsley, garlic and lemon are just about as classic a combination as exists in cooking — and, it’s a combo that is paired with chicken all the time. Here I add a ton of garlic, but it’s roasted first, with adds a needed jolt of umami richness to an otherwise subtle and delicate dish. Don’t worry, you won’t get garlic breath from all this garlic; roasting mellows and sweetens it considerably. The lemon goes in at the end to brighten everything. A word on the pheasant thighs. Note that there are no drumsticks here. This is because you really can’t just sit and eat a pheasant drumstick — there are just too many tendons, which will not break down ever. That’s why I always separate thighs from drumsticks on pheasants and turkeys. If you haven’t done this, my advice is to separate the thighs and drumsticks before you cook them, and, when everything’s tender, fish out the drumsticks, pull off all the meat and put it back in the braise. Keep the thighs whole; they’re easy to deal with at the table. 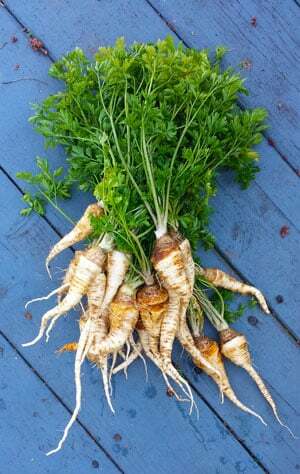 Don't get all hung up on the parsley root, although if you can find it use it. Parsnips are an excellent substitute, but so are carrots of any color, turnips, rutabagas or celery root. Or use a variety. 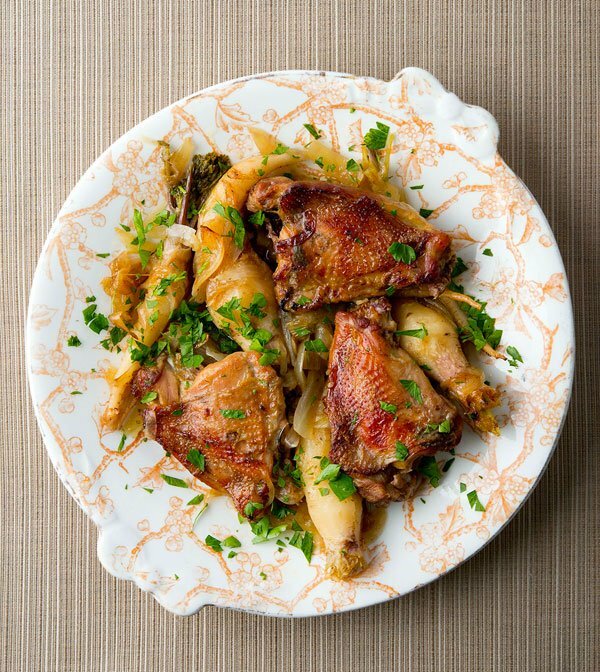 Ideally you will have skin-on thighs here, but this recipe works with skinless thighs, too. Obviously chicken thighs are a good sub if you don't have pheasant, and turkey -- wild or domesticated -- works, too, as would the thighs off a ruffed grouse. The one thing not to skimp on is the roasted garlic. Yes, you want two whole heads. Don't be scared: The flavor sweetens and mellows once the garlic has been roasted. If you don't know how to roast garlic, read this tutorial. Start by roasting the garlic. Preheat the oven to 375°F. Slice the top quarter off the heads. Nestle them into some foil and drizzle the olive oil into the cut ends. Close the foil and set in the oven to roast until browned and soft, about 40 to 50 minutes. When the garlic is done, drop the heat to 325°F. Meanwhile, make a quick stock from the greens and peelings from the root vegetables and parsley. Chop the stems of the parsley you're using to garnish, and add them to the peelings of the roots, along with the tops if you have them. I like to add the fronds from a fennel bulb, too, but it's not strictly necessary. Cover everything with 3 cups of water and bring to a boil. Drop the heat to a simmer and cook gently while the garlic is roasting. While all this is going on, brown the pheasant thighs in the pheasant fat (or butter) in a large Dutch oven or other heavy, lidded pot. Salt them as they cook. Once the pheasant has browned, set it aside for the moment and saute the onion over medium-high heat until the edges brown. Salt the onion as it cooks, too. When the garlic is ready, remove it from the oven and let it cool a bit. Put the root vegetables in the Dutch oven with the onions and squeeze out the garlic into the pot. Set the pheasant skin side up on top of everything. Strain the stock and pour enough into the Dutch oven to come up to the level of the skin on the pheasant. Don't submerge them. Sprinkle a little salt over everything. Cover the pot, put it in the oven and simmer gently for 90 minutes. 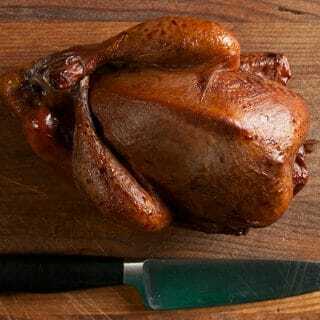 When the thighs are tender, uncover the pot and jack the heat up to 425°F to re-crisp the pheasant skin. This should take about 15 to 20 minutes. When you are ready to serve, take the Dutch oven off the heat and add the minced parsley, lemon zest and juice, and grind some pepper over everything. Serve with crusty bread, potatoes or rice. 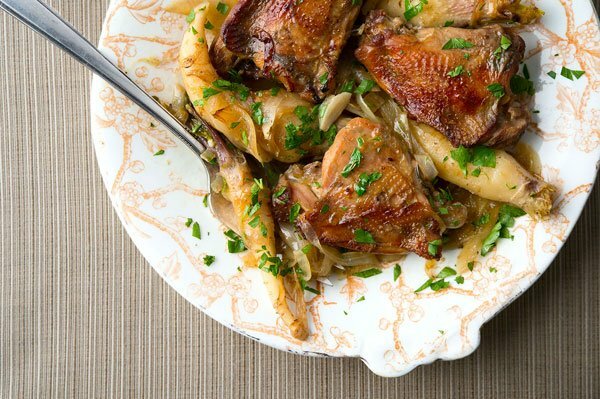 Serve this dish with a full-bodied white wine such as a Cotes du Rhone, Chardonnay, Viognier or an off-dry Riesling. For beer, go with a crisp lager or a pale ale. Once made this will keep in the fridge for a week. 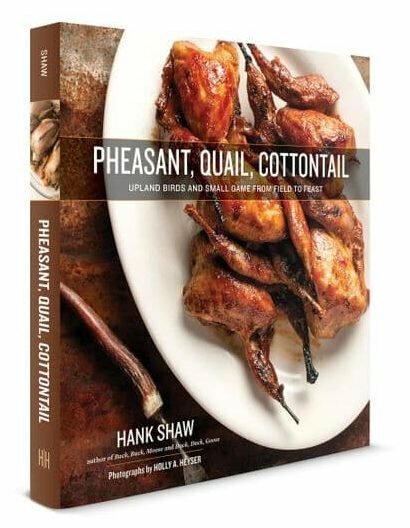 You can find all sorts of recipes for pheasant and other upland birds here on Hunter Angler Gardener Cook! Looks amazing! Right up my alley. Just need to convince the wife, since she’s the chef of the house. I just wanted to say thank you for this recipe. 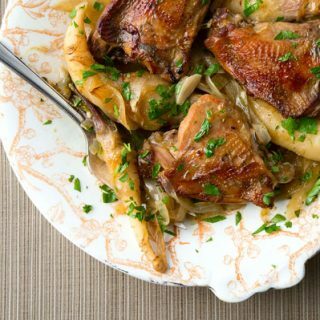 I live in the UK and stumbled upon this page a month ago after buying some pheasant thighs and not knowing what to do with them! I used a parsnip and some carrots instead of the parsley root and oh my goodness, it was delicious! We only had half the amount of pheasant, but cooked the full amount of veg and used half the left overs the next day with some chicken. It was so tasty that I bought more thighs yesterday and will be cooking it again today 🙂 New favourite Sunday dish!